Documentation: Photograph: 3 Feb 2007 Madison Co.
Taxonomy: Nine or ten subspecies are recognized throughout Eurasia (Gill and Donsker 2017, Pyle 1997). The introduced North American population is derived from some 20 birds released in St. Louis, Missouri in 1870; these birds were thought to be from Baden-Wurttenberg, Germany (Barlow et al 2017). At least one fertile hybrid with House Sparrow P. domesticus has been reported (Lowther and Cink 2006), and, more recently, one was photographed in Polk Co, central Iowa 3 Jul 2018 (Dougherty, https://ebird.org/view/checklist/S46975506). 24 Jan-15 Feb 2007 Madison, Madison Co (Brogie 2008). 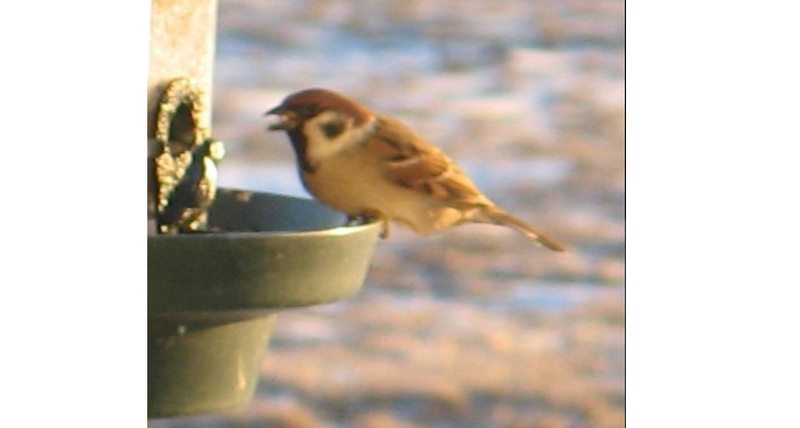 This bird had been frequenting a feeder at the Rausch residence in rural Madison Co with House Sparrows since about 24 Jan, and was seen by several observers through 15 Feb (Brogie 2007). Comments: The nearest record of this normally sedentary species prior to the 2007 Nebraska record was from Greene Co in west-central Iowa; it is gradually spreading northwestward in Iowa and Illinois from the St. Louis, Missouri area, but its range is still mostly limited to southeastern Iowa (eBird.org, accessed April 2018). There is one record for South Dakota (Thompson and Tallman 2005), several for North Dakota and recent sightings from Minnesota and western Missouri (eBird.org, accessed April 2018). If the current pattern of northwestward expansion continues, Nebraska records are anticipated to increase over time. Photograph (top) of a Eurasian Tree Sparrow at Lake Enola, Madison County 3 Feb 2007 by Mark A. Brogie. Brogie, M.A. 2007. Eurasian Tree Sparrow- a first record for Nebraska. NBR 75: 118-120. Thompson, R., and D.A. Tallman. 2005. Eurasian Tree Sparrow- a new species for South Dakota. South Dakota Bird Notes 57: 83.